A compact, upright shrub with white flowers in the spring and glossy green leaves. The late summer berries go from green to bright pink and blue. Fall foliage is a dark maroon-red. 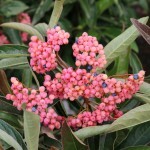 It is a good pollinator for Viburnum nudum 'Winterthur', and will berry best if they are planted close together. It grows best in full sun to part shade in an average well-drained soil. Prune as needed in late fall or early spring. PP 12,870.